Mushers and their dog teams take off at the start of the Can-Am Crown International Sled Dog Races in downtown Fort Kent. Mushing is a team sport where human and dogs each do their part to cover a lot of snowy ground together. While any dog can learn to ski in front of its human, sled dogs are huskies that have been bred over generations for the sole purpose of running and pulling. Nothing — and I mean nothing — makes a husky happier than seeing the mushing gear coming out and the prospect of running. Don’t believe it? Check out a sled dog race and take a look at the sad, frustrated faces of the dogs left behind. Listen to their howls of protest as they watch their four-legged teammates take off. 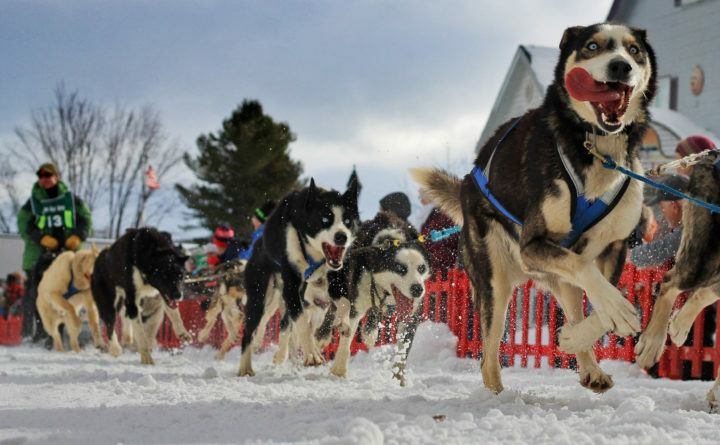 While some kennels have bred huskies with faster dogs like German Shorthair pointers or the speedie Salukis to get a faster, leaner racing sled dog, the bulk of dogs involved in the sport are the traditional huskies — the Siberians, the Alaskans and the Malamutes — and you definitely need more than one to pull a sled. A sled dog team is only as good as its lead dog. This is the dog that runs at the very front of a team and follows the musher’s commands to “gee” [turn right], “haw” [turn left], “on by” [ignore distractions], “whoa” [come to a complete stop] and “line out” [stand perfectly still to hold the team in place while stopped on the trail]. It’s a lot to ask of a dog, so the best lead dogs are smart, confident and in tune with their musher. Next down the line are the “point dogs.” It’s their job to help the leaders guide the team. Behind the point dogs are the “swing dogs,” and they are the ones who do the most in steering a team around the corners. All the dogs behind the swings are “team dogs.” They are the brawn that do the major pulling. The last dogs in the line are often the largest and strongest. Known as the “wheel dogs” they are the ones who do the heavy work if a sled gets stuck in snow or ice and needs to be pulled out. The dogs run in pairs, so to fill each team role with two dogs, it’s a minimum 10-dog team. However, mushers can and do run happily with teams as small as three or four dogs. In distance mushing, on the other hand, it’s not unusual to see teams of 16 or even 22 dogs. Traditional dog sleds are made of wood with the main body, or “basket,” riding on two ski-like runners. The musher stands footboards on on these runners that extend beyond the rear of the sled and hangs on to the “handle bar” that rises over the basket. Unlike skijoring, mushing has ways to slow and stop the dogs beyond voice commands. Dog sleds are equipped with “drag mats” that extend between the footboards. By standing on or using a foot to push down on the mat, the sled becomes more difficult to pull, and the team will slow down. There is also a brake that has claws to grip the snow and ice. Like the drag mat, it is foot-operated. Dog sleds are still made of wood, but modern sleds are also made out of lighter weight materials such as carbon fiber for serious racers who are looking to get the lightest sled possible so their dogs can cover longer distances faster. There is really no such thing as a “casual musher.” Taking care of the team from feeding to scooping poop to checking each dog daily to assess their health and condition is nonstop. A running team is a happy team, so the dogs should be harnessed up and ran several times a week at the minimum during the winter. Then there is the expense. Team dogs can cost anywhere from $50 to $200. A proven, trained command leader can go as high as $1,000 or more, depending on the dog’s lineage. A good, used sled can be purchased for around $400, with the top racing sleds going for upwards of $6,000. Then there are the harnesses, one per dog; tow lines to attach the dogs to the sled; and specialized “booties” worn by the dogs when conditions warrant. High-quality dog food for even a small team can run around $1,500 per year, with veterinary costs in the hundreds of dollars for routine exams, vaccines and supplements. All in all, it can be a sizable investment to get started and maintain a team. But there is also no better way to spend a bright, crisp Maine day than behind a team of huskies running down the trail. Luckily, there are kennels in the state that offer rides so anyone can get the thrill of mushing for an afternoon or overnight trek. Among them are Mahoosuc Guide Service in Newry, Lone Wolf Guiding Services in Greenville, Maine Dog Sledding Adventures in Millinocket, New England Dog Sledding in Mason Township and Song in the Woods in Abbot. With these friendly folks, all you need is a love of dogs and adventure. This story was originally published in Bangor Metro’s January/February 2019 issue. To subscribe to the magazine, click here.